Last summer I signed up for a two day workshop on Japanese woodblock printing. Circumstances conspired (our car broke down) so that I only attended the first day, but in preparation I had done a bit of research. The other day I received a lovely card which reminded me of some of that research, and prompted me to seek a little further for this post. 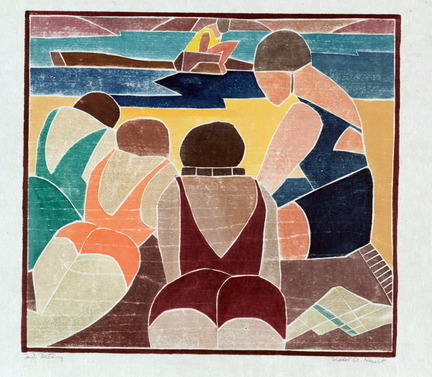 Japanese woodblock prints were popular in the heart of the modern art world in Paris at the time after the Great War when several American artists were visiting. 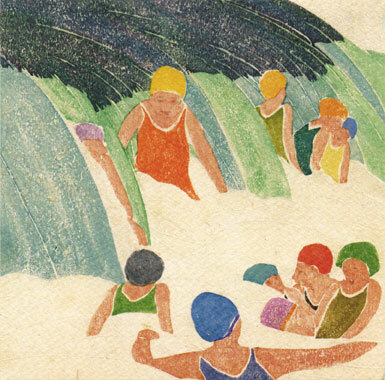 These artists returned to pass on their enthusiasms, and so it was that some American artists even went to Japan to learn techniques. Edna Boies Hopkins was one of those. It was her image of Cascades on the card I received this week. Japanese woodblock printing involves making a separate plate for each colour used in the design. Printmaking in Japan was an industrial process in so far as the publisher commissioned the image from an artist, then the plate makers cut the wood into as many plates as necessary, after which the printers printed each colour onto the very large editions – the prints were extremely popular. However, for the artists in the burgeoning summer art colony of Provincetown New England this process was too longwinded. They ingeniously invented white line woodblock printmaking. This involved cutting a line of separation between different coloured elements in a design, so that each colour could be printed from the same plate. The result is rather like painted silk using a gutta (glue) outline round each area which is to be coloured. Here is an excellent post describing the simple stages of the process. It is mostly women who were known for using this technique. are but a few. There is an excellent section on this seemingly totally American art technique and its artists in the book American Women Modernists edited by Marian Wardle. (Unfortunately this is now out of print and is being offered for sale online at ridiculous prices!) 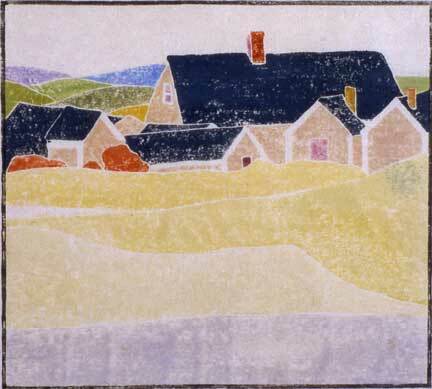 And there is more information in an academic paper by Maura Coughlin on Southcoast New England Printmaking. 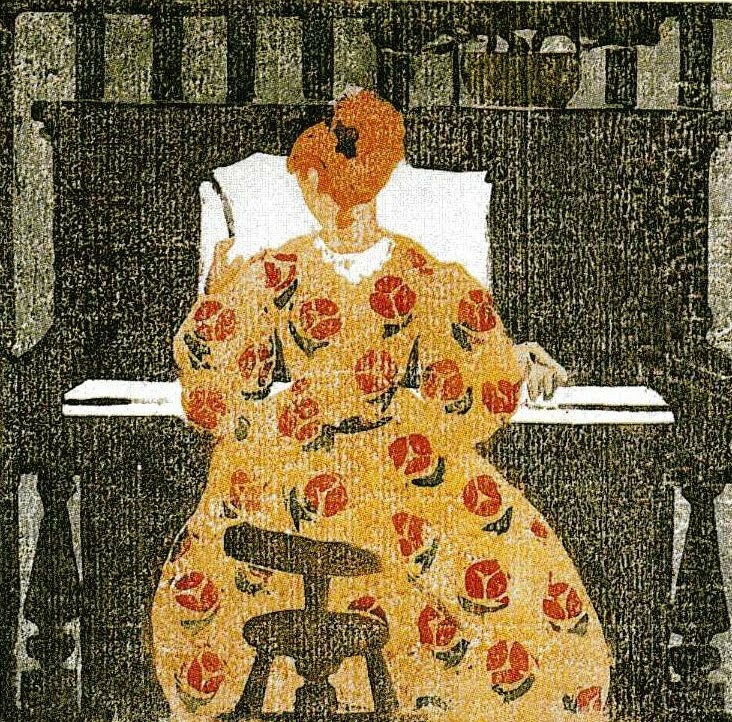 I am interested to see that these white line printmakers have been influenced by the French artists (Ethel Mars’ work reminds me of Vuillard, for instance), Post Impressionism, with touches of Cubism, but have their own delightful character. I must say that my favourites are the ones who use the white space for more than simply delineation – as Edna Boies Hopkins does in Cascades. White line printmaking is becoming popular once more, with new practitioners and workshops offered even in the UK. I have not tried it yet myself but I certainly very much like the idea of the technique. Thank you Tess. I must check it out. Printmaking is a fascinating art, highly dependent, I think, on lines and mark making as opposed to the painterly emphasis on big shapes smooshed with internal colors. I’m painterly myself, but always yearned to be otherwise. Of course, that’s an oversimplification, since the lines form shapes that, at least within these techniques, tend to be large and simplified. I suppose I’m thinking of etching, etc., where the line-making is essential. Anyway, the white line technique you mention, Olga, is an interesting change from the “black line” technique that I know from the work of Terry Grant (others use it, but I’m most familiar with Terry’s — http://andsewitgoes.blogspot.com/ ). She trained in part as a graphic artist, and many of her textile pieces incorporate stitched or fabric lines, black, around the primary images, setting them off, making them clean and clear. I think they work beautifully with the shapes that one can make with fabric, combined, as Terry does, with shadings and tonings. Do you have a sense of the difference that using black lines would make with images and/or context? Are white lines “softer”? Better with landscape? First, June, printmaking can be more painterly, especially in the case of mono prints and lithographs. It is also possible to use inks in ways that render the result more painterly. 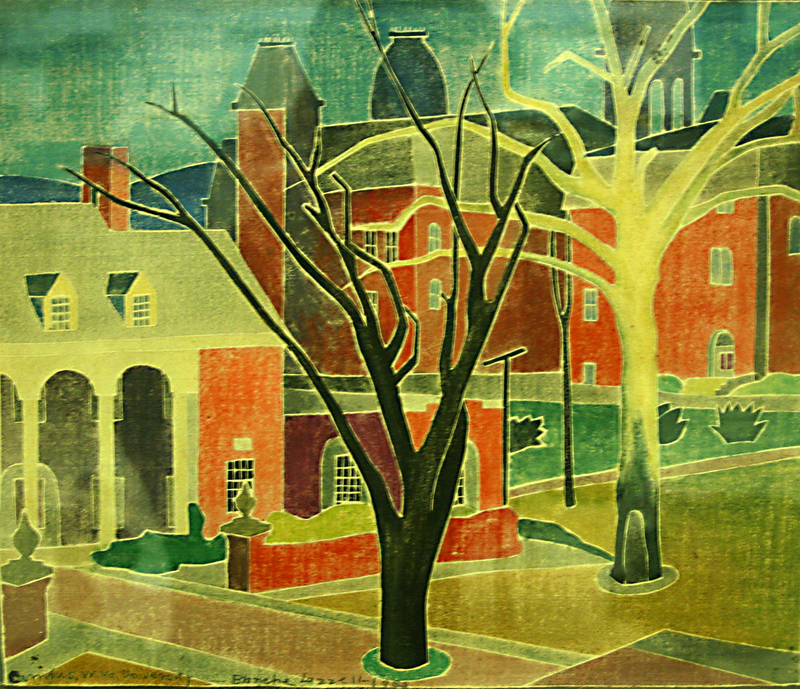 Woodblock printing also can transfer shadings of colours – as well as utilising the grain of the wood to give a painterly effect. I like the effect of black outlining, and use it myself where I employ reverse applique to a black fabric. It can ground an image, or part of an image – or throw elements into sharp focus. It can also act as a containment, and a clarifier. Overall as with most techniques, I think that the result depends very much on the artist. 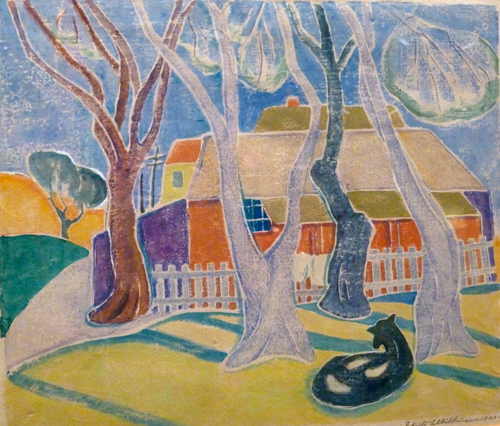 So often initial use of a technique develops a style, which so many subsequent artists believe necessary to continue emulating when using the technique. why do you suppose it got to be a “women’s technique”? I am fascinated to come across these niches that for no reason at all are tagged with a particular demographic. but back to the art — how would you apply the paint or ink to the plate? with a brush? it must be tricky to apply so many different colors to the plate without having the first ones dry up before the print is finally pulled. Kathleen, answering your second question first: the colours were printed one by one. The paper was fixed to one side of the plate so that it was permanently registered. Then each discrete area for each colour within the white line outlines had watercolour brushed onto it (in Japanese woodblock printing they add a little rice paste to make it stickier and delay the drying), and the paper was then hand smoothed over the plate. After each colour area was dry they would go onto the next one. I guess that apart from the reason I suggested to Marja-Leena, perhaps it was because there were more women artists in the summer art colony. In one of the references I found it said that the colony was so popular that there were not enough presses to go round – so maybe the ladies were more accommodating and just got on with a technique which did not need a great deal of equipment. Fascinating to read, Olga, as this is all new to me. I love the prints, particularly the Wilkinson, Lazall and the Hewitt is my favourite. It’s fascinating to see the influence of French artists, but as you say, they all have their own individual character. Lovely, and thank you. I’m glad that you like the prints and find the history and technique interesting. Women in art so often crop up in forgotten nooks and crannies of history! This is indeed fascinating, thank you Olga, and I too will explore the links. I think one or two artists who had worked in our printmaking studio some years ago used this method (even on lino) but as far as I know did not use the term “white line”. Interesting too that mostly women used this technique. Marja-Leena, the white line solution is an obvious one for anyone keen to get on with a print without being purist about Japanese techniques. I was thinking myself that it would work for lino as well. 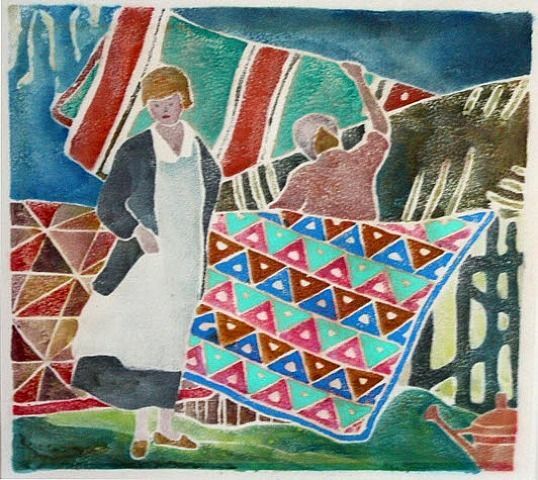 The technique of course also means that prints can be made without a press, and this would be more convenient for women who also had a house to run and children to look after. Olga…Thank you for adding to the information I am gathering on printmaking as I have begun to explore how I can use those techniques in my artwork. You have provided some grand links to explore, and indeed I will do that, and images to provide the visuals that clearly articulate the topic you are exploring with your post. Woodblock prints have always pulled my eye to stay a while and look at the image(s). My library on-line has some volumes with information on the artists you have highlighted and requests for those tomes have just been entered and I look forward to doing some more reading on the topic. Alas, the out of print book is not held by this system but I will use an inter-library loan to read it. Kristin, I have found printmaking to be a wonderful field for exploration. I just must try to find enough time to do some practical work too!